Teardrop-shaped pendant of white plastic attached to a synthetic tennis racket string threaded through a black plastic tube. Laminated formica, machine-cut and hand-polished. Synthetic tennis racket string threaded through hollow flexible plastic tube and used to tie other components together. 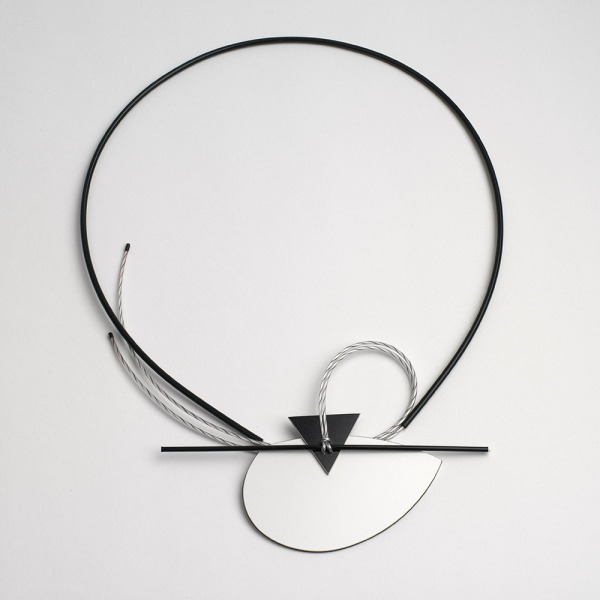 Neckpiece, Louise Slater, 1984, Crafts Council Collection: J179. Photo: Todd-White Art Photography.